Is there anything that captures the essence of spring more than seeing a bee land sweetly on a beautiful flower? Although the U.S. listed a species of bumblebee as endangered this past January, there is still hope, and good news, coming from our buzzing friends. Like the fact that all worker bees are female! Yes, really. Bees don’t only produce delicious honey and nectar, but now they’re our new feminist icons. 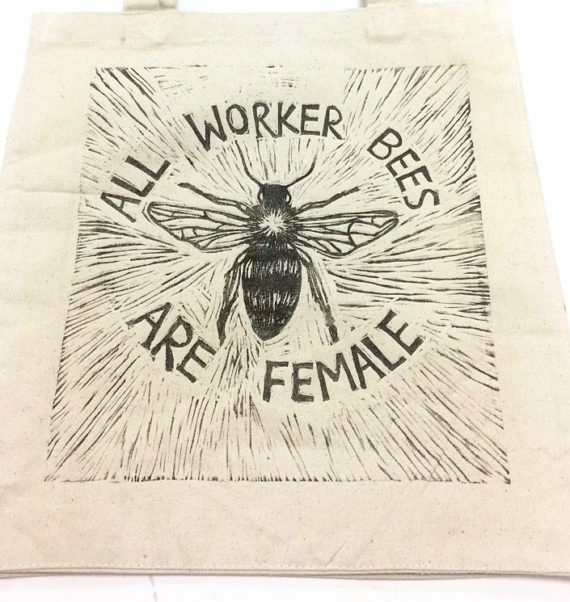 Rayne MacPhee is an artist and hobby beekeeper from Charleston, South Carolina who’s taking our new favorite, beelicious feminist fact and making it into the coolest accessory around. 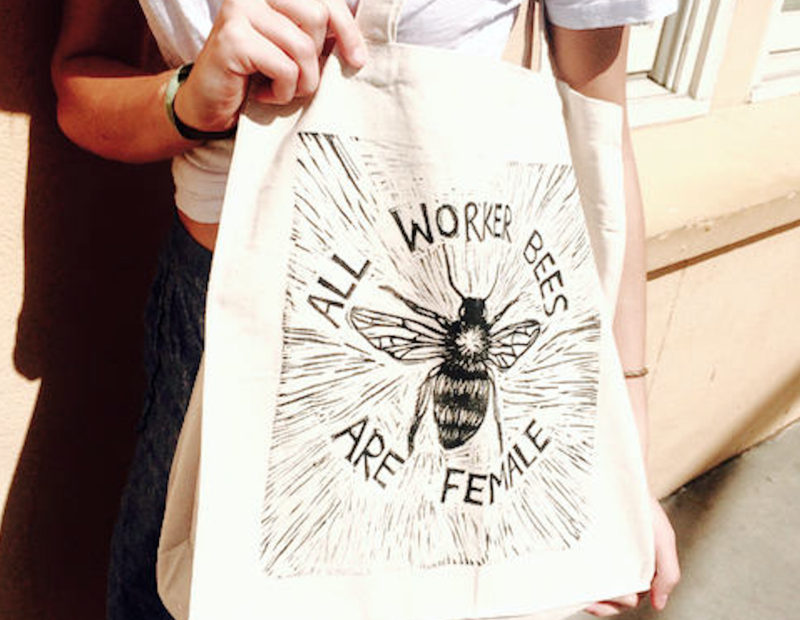 Her hand-printed “all worker bees are female” totes aren’t only cute, they’re also for a great cause. 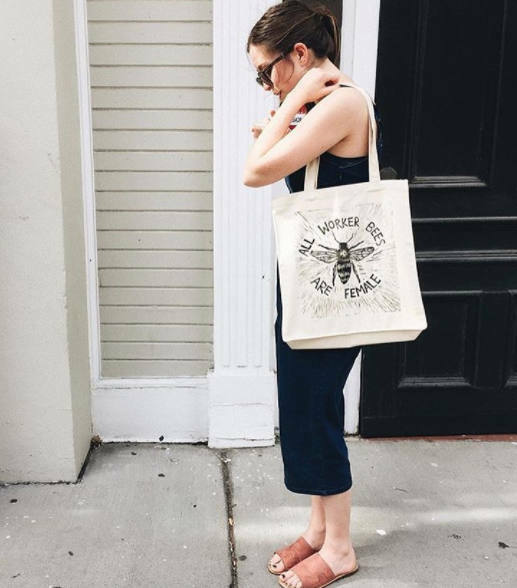 10% of each tote goes to The BeeCause Project, a non-profit that educates kids about bees. Plus, each bag comes with a packet of wildflower seeds so you can also help save our bee-ffs. "A friend of mine and fellow artist, Leigh Sabisch, had this brilliant idea to host a PP fundraiser in a Charleston bar and sell prints of local artists' work. Aside from making art, I am a hobby beekeeper, so a lot of my work tends to incorporate images of honeybees or honeycomb. I have always loved the fact that all worker bees are female, so I made this linocut (which is basically a giant stamp) to support BOTH honeybees and femininity. My prints were a huge success at the fundraiser, so I thought I should start printing them on tote bags!" We want to wear this tote all summer long. Perhaps even to the farmers market to buy some honey or some beautiful wildflowers pollinated by some sweet bees. These totes are available for $20 on Etsy, but hurry up! We have a feeling these will be flying off the shelf.